, with images of old Yiddish postcards! Two Fabulous Events This Fall! Two Cabarets, two different lineups! Sunday, October 30, 6:30-9:45pm, KlezCalifornia Klezmer Workshop and Jam, PALO ALTO, led by Dmitri Gaskin. 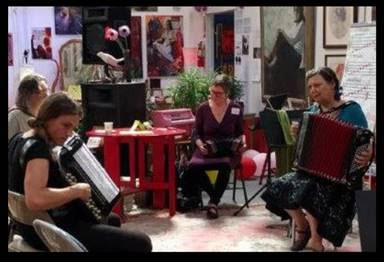 Session 1: 6:30-8:00pm, Klezmer Instrumental Workshop for musicians with little or no klezmer experience but who are proficient on their instruments. This session will include playing tunes with charts, getting familiar with klezmer techniques, and learning some tunes by ear at a slow pace. Some of the eighteen participants in the 2016-09-25 workshop and jam. Photo by Les Plack. Session 2: 8:15-9:45pm, Klezmer Jam for those with at least intermediate familiarity with playing klezmer and/or jamming. After the leader begins the session with a warm up tune or two, musicians will take turns "calling" a tune, with everyone learning new tunes by ear or enjoying playing/improvising on familiar ones. The leader will provide guidance for pace, transitions, and ensure an overall smoothly run and fun evening! Also join us for our first workshop and jam in San Francisco, Sunday, November 6, 1:00-4:15pm, led by Dave Rosenfeld, at Congregation B'nai Emunah. Come for both events or just one, both sessions at each event, or just one. Rsvp requested, and please tell us which event(s), which session(s), and what instrument you play. Drop-ins also welcome.Refreshments provided. Donation of $10-$20 requested. We will also add you to a special mailing list through which you will receive more information about these and other workshops and jams. , San Francisco event Facebook page.
" video with the Holocaust Survivor Band, produced and directed by Daniel Finkelman (thanks to Evie Groch). for literature in 1978 (in Yiddish) (thanks to Arje Shaw). , with reports from Australia, Israel, Russia and Poland, and songs (thanks to Paula Teitelbaum). 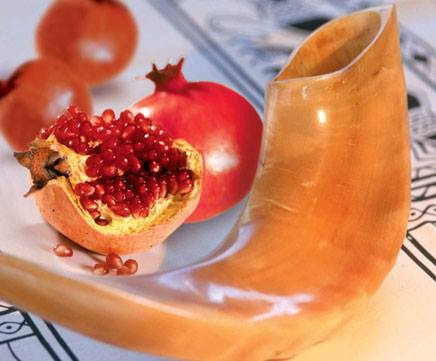 Proverb of the month: If you haven't contributed, you're not allowed to spit in the kasha, i.e. don't criticize an enterprise in which you refused to take part (Ver es git nisht tsushtayer, tor nisht in der kasheh araynsphayen) (from: "Rhapsody in Schmaltz," by Michael Wex). Violinist returning to the Bay Area looking to make musical connections in the Bay Area. Classically trained and open to playing Jewish, Klezmer, Tango, Gypsy Jazz etc. Has performed with the Houston Symphony, Indianapolis Symphony, Louisiana Philharmonic, at the Aspen Music Festival, and more. Contact juliettejavaheri[at]gmail.com. Check out other listings of musicians seeking others. 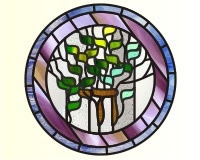 Tuesday, October 18 (and subsequent Tuesdays), 7:30-9:30pm, San Francisco Jewish Folk Chorus rehearses. 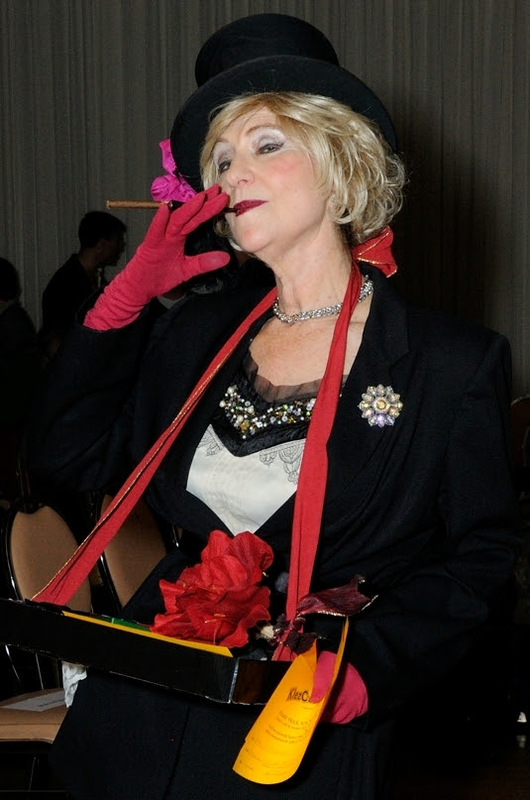 Sings mostly in Yiddish; all levels of singers welcome. Dues: $100/year. More info:510.533.3903, mailbox[at]jewishfolkchorussf.org. Thursday, October 27, 10:30am-12:00noon, Klezmer Music 101 with Mark Levy. Tickets: $15 donation requested. Sponsored by Sequoia Hadassah. More info and to rsvp:leahkbernstein[at]gmail.com. Sunday, October 30, 6:30-9:45pm, KlezCalifornia Klezmer Workshop and Jam, led by Dmitri Gaskin. See details in box above. Sunday, November 6, 1:00-4:15pm, KlezCalifornia Klezmer Workshop and Jam, led by Dave Rosenfeld. , and in box above. Sunday, November 20, 2:00-4:00pm, KlezCalifornia Flisik Yidish Salon. For fluent Yiddish speakers. No charge. More info: 415.789.7679, flisik[at]klezcalifornia.org.